Facebook has announced a new addition to its ‘Collections’ saved content option, which enables users to gather groups of posts, videos, Marketplace listings or ads and save them in a separate list. Now, users will also be able to share their Collections with friends, and invite other users to add to the listing. A quick note of clarification – there are actually two separate Facebook products called ‘Collections’. One is Collections ads, which Facebook launched last year, and which enable brands to use video and still images together in a single ad post. The other is saved Collections, which is what’s being referred to here. The two are not connected. 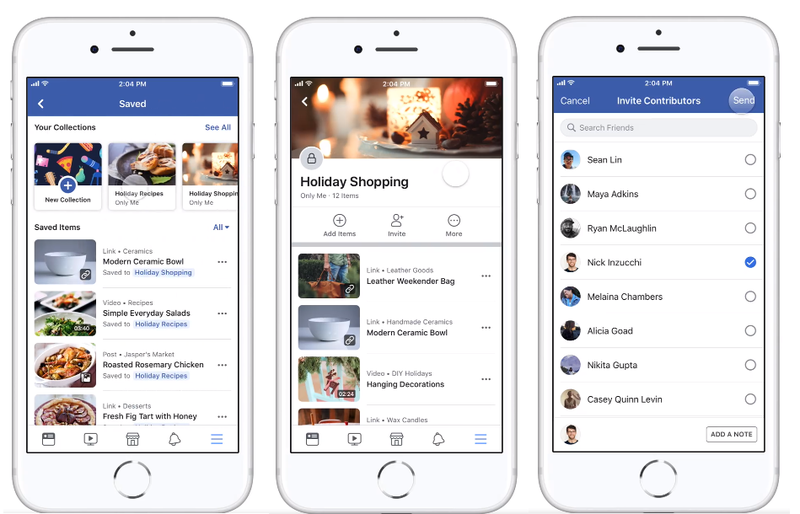 As Facebook notes, users have increasingly been saving posts and ideas into dedicated collections for events and projects, and the new addition will add to their capacity to use the tool in a more collaborative, engaging way. The option is also very similar to Pinterest’s ‘Group Boards’ which it launched earlier this year. Definitely, you can imagine the collaboration potential. It’s not a major addition, but given that millions of people are already using the feature daily, it’s one that may prove popular, and worthy of note. In terms of brand use, it may open up new avenues for micro-influencer collaborations, using widely shared lists to help promote specific products or tools, through scalability could be problematic. Either way, it’s another consideration, and another way for Facebook users to share and engage with product posts on the platform – which is a business consideration within itself. If an increasing number of people, for example, start using the option for, say, wedding plans, then it’ll definitely have more immediate promotional application. Facebook says that the new collection sharing feature will roll out for everyone on Facebook over the next week.